Few people realize that trade agreements concretely affect their lives on a daily basis, down to the food they and their children eat. 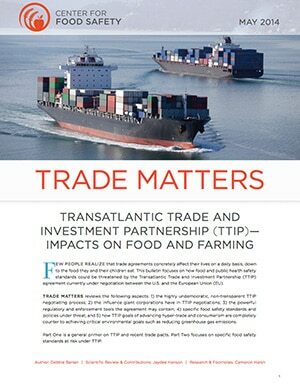 This bulletin focuses on how food and public health safety standards could be threatened by the Transatlantic Trade and Investment Partnership (TTIP) agreement currently under negotiation between the U.S. and the European Union (EU). Trade Matters reviews the following aspects: 1) the highly undemocratic, non-transparent TTIP negotiating process; 2) the influence giant corporations have in TTIP negotiations; 3) the powerful regulatory and enforcement tools the agreement may contain; 4) specific food safety standards and policies under threat; and 5) how TTIP goals of advancing hyper-trade and consumerism are completely counter to achieving critical environmental goals such as reducing greenhouse gas emissions.